The Temple of Thanksgiving was the first temple Rev. Master Jiyu-Kennett went to on landing in Singapore in 1962. It is dedicated to Ksitigarbha Bodhisattva. 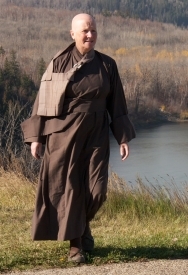 On the web site you can read about reports of unexplainable occurrences connected to Ksitigarbha that were witnessed by a Ms. Pitt, who was a remarkable woman. There is a photo of the inside of the temple and some details about my stay there last June here. Tomorrow Buddhist in Edmonton will gather at the large Vietnamese Temple on the north side of town to celebrate Wesak. We will be there.